Apart Lukas Apart Lukas in Mathon, 4 km from Ischgl, is just a 2-minute walk away from the stop of the free ski bus and offers you fully equipped apartments with satellite TV. Within a 5-minute walk you can reach several restaurants. Apart Salner A 5-minute walk from the Ischgl-Samnaun Ski Area and Ischgl’s centre, Apart Salner offers Alpine-style apartments with mountain views from the balcony. Guests can also store and wash their bicycles at Apart Salner..
Apart Andrea price per day from € 35 Mathon’s Apart Andrea offers units with south-facing balconies that have unobstructed views of the surrounding Alpine landscape. All units at Apart Andrea have a kitchen or kitchenette, a dining area, bathroom, seating area and flat-screen TV with satellite channels. Hotel Garni Alpenhof Hotel Garni Alpenhof is just 100 metres from the Pardatschgratbahn Cable Car and 300 metres from Ischgl’s centre. Spa facilities include a Finnish sauna, a bio sauna, a steam bath, an infrared cabin, and a tea bar..
Dorfplatzl Dorfplatzl is in the very centre of Ischgl, just 300 metres from the Fimbabahn Cable Car and the Silvretta spa and wellness centre. The elegant apartments are equipped with modern Alpine-style furnishings. The apartments come with 2 bedrooms, an eat-in kitchen with a dining area and a sofa bed, and a bathroom with shower and toilet..
Alpinea Appartements Situated in the quiet location of Ischgl, alpinea Appartements is 700 metres from Fimbabahn and Pardatschgrad Cable Cars of the Silvretta Ski Area. Furnished in modern style, the apartments offer panoramic views of the surrounding mountain scenery. Free private parking, ski storage and ski boot drying facilities are available on site. Appartements Chasa Valletta Located in the centre of Ischgl, Chasa Valletta is only a few minutes’ walk from the ski lifts. Guests can go fishing at the nearby lakes, which are stocked with trout and char, and benefit of the barbecue facilities at the Chasa Valletta. As of summer 2013, the Silvretta All Inclusive Card will be included in all rates during summer season..
Hotel Tannenhof price per day from € 51 This family-run 3-star superior hotel enjoys a quiet location next to the forest, 3 km from the centre of Ischgl and the Silvretta Ski Area. The Tannenhof’s restaurant serves Austrian cuisine and traditional Tyrolean specialities, with many products coming from the hotel’s own farm. 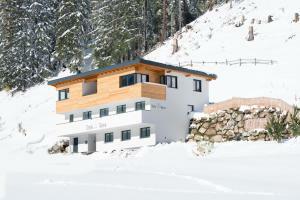 Guests can play table tennis, buy ski passes, and use a ski storage room with a ski boot dryer..
9. Take exit Landeck West toward Stanz/Grins/Pians/Tobadill. 10. Turn left onto Graf171. Continue to follow B171. 12. Sharp left onto Mühlweg. Ski resort Andelsbuch, downhill pistes: 15km. 53 km from town of Ischgl. Ski resort Alpenarena Hochhäderich, recommended ski resort for beginners. 54 km from town of Ischgl. Ski resort Alberschwende, number of cross country pistes: 10km. 59 km from town of Ischgl.